Posted on Sat, Mar 24, 2012 : 8:15 a.m.
As teen-minded literature turned into teen-minded cinema goes, it's easy to get suckered into thinking "The Hunger Games" is deeper and richer than it is. Set in a dystopian future, this clever mash-up of "Battle Royale," Shirley Jackson's "The Lottery" and Stephen King's novella "The Long Walk" has enough white-knuckle suspense, adrenalized emotion and populist sentiment to appeal to both genders and both sides of the political aisle. But much as it seems to have something to say about media violence, feminist strength and the plight of the 99 percent, this film by director Gary Ross ("Seabuscuit," "Pleasantville") is more about presenting well-trod ideas than exploring them. 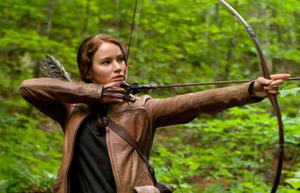 Instead, it's better to approach "The Hunger Games" for what it is: well-crafted entertainment that questionably uses the hunting and killing of children as a way to stoke undeniably dramatic fires. That it is rated PG-13 while the soon-to-be released documentary "Bully" (which confronts bullying in our schools) received an "R," says some rather unflattering things about our culture. Sun, Mar 25, 2012 : 2:38 p.m. In all fairness, Great Britain wants to tack on an R rating for this movie because of 7 seconds of blood guts and gore. I agree, Bully needs to be a PG 13 if another country is complaining about 7 seconds of nasty. Go figure. Maybe instead of bleeping the profanity? Reword it? Just a thought.